I can’t believe these are vegan chocolate cupcakes! That’s what you’ll say. I promise. They’re rich and moist. You won’t miss the egg one bit. It’s been our go-to vegan cake recipe since we found out our daughter was allergic to eggs and dairy many years ago. Since then we’ve made lots of cupcakes and cakes with this simple recipe. It’s the birthday cake everyone requests…even if they aren’t vegan. And, it’s the cupcake we dress-up for Valentine’s Day, July 4th and Christmas. We even make vegan Chocolate Pumpkin Cupcakes using a variation of this recipe that’s perfect for fall and Thanksgiving. It doesn’t require frosting. 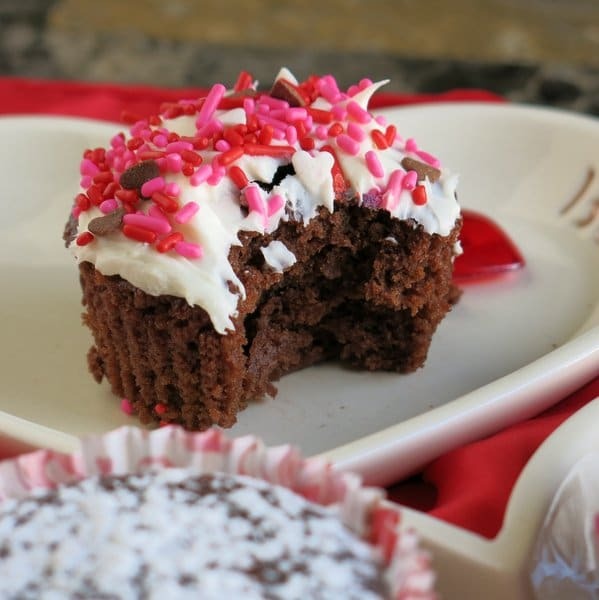 Simply top this vegan chocolate cupcake recipe with chocolate chips or powdered sugar and it’s a winner! Or, dress it up for a special occasion with icing and sprinkles. Be sure to check out the pictures below with our favorite twists! Need cupcakes in a hurry for a bake sale or event? No problem! Follow these tips to have the perfect dry mix made up ahead of time. 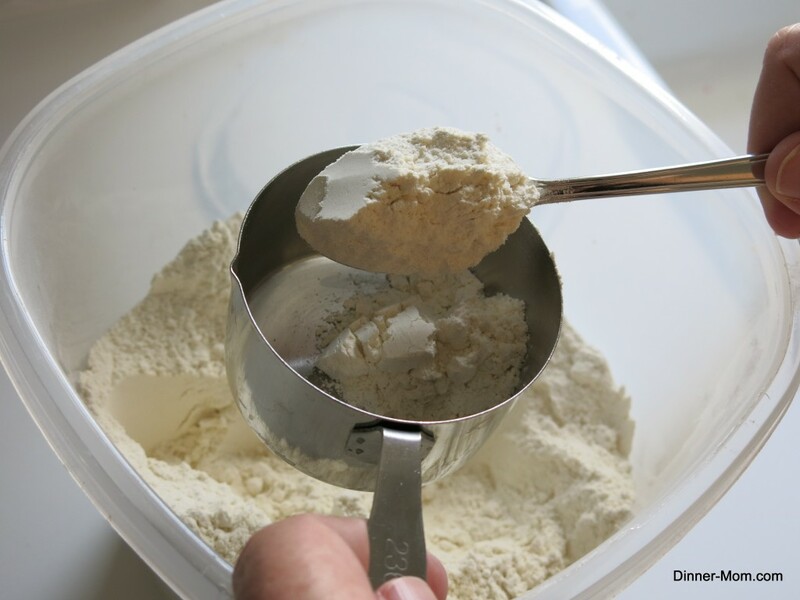 Tip #1 – Measure the proper amount of flour by spooning the flour into the measuring cup and then leveling the top with a knife. If you scoop the flour into the measuring cup (instead of spooning it,) you may get too much flour and the cupcakes will be dense. Also, mix the dry ingredients together first and then add the wet ingredients, which will ensure that the dry ingredients are properly distributed. There’s no need to use beaters. Just stir with a spoon until well-blended. Tip #2 – Let the cupcakes cool for about 30 minutes before eating or decorating. I’ll admit we often violate this suggestion and wait maybe 10 minutes. The cupcakes are not fully firmed-up at this point. Wait! After they cool, this brownie-like cupcake with a glass of milk is heavenly. No topping needed! 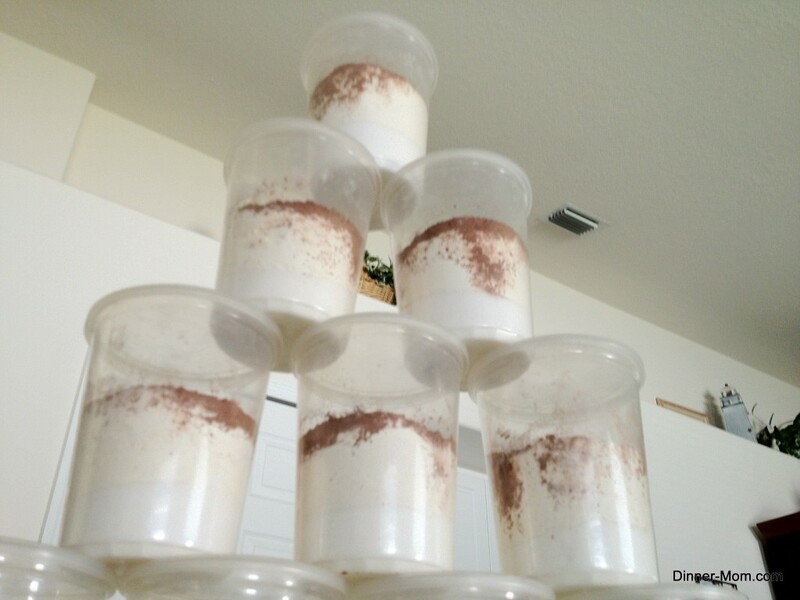 Tip #3 – Make batches of the dry ingredients up ahead of time, while you have everything out. Store in containers or plastic bags that seal. This recipe is a bit unique in that no topping is necessary. 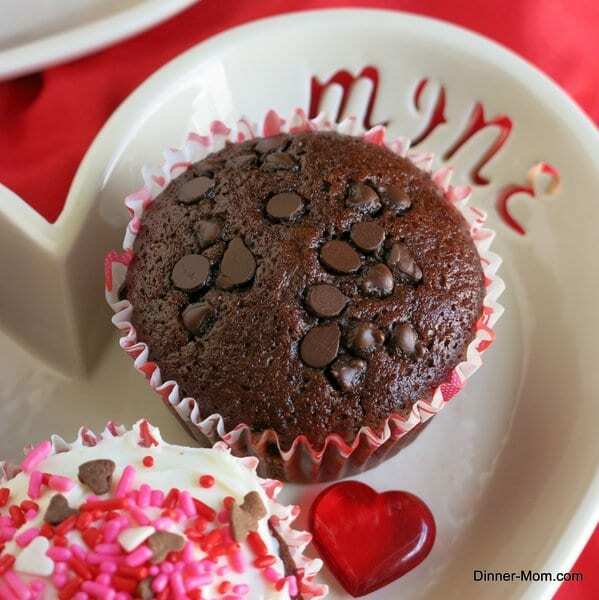 These vegan cupcakes have a very fluffy brownie like consistency. But, decorating them is fun and will turn this recipe into a decadent dessert. I hope you take some inspiration from these photos and ideas. Sprinkle a few over the top of the batter in the muffin tin. We used vegan chocolate chips for the cupcake pictured below. White chocolate or peanut butter chips would be nice too. Sprinkle powdered sugar on just before serving otherwise it melts into the chocolate…which I’m not so sure is bad thing. We usually make Hershey’s Perfectly Chocolate Frosting using vegan butter sticks and rice milk to frost these cupcakes. However, there are several commercially made frostings that are egg and dairy free, including many made by Pillsbury. Take your pick from all the gorgeous sprinkles you will find at the store. They are generally vegan too. 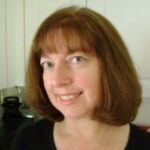 We try to add products we use and love to our Amazon Shop! 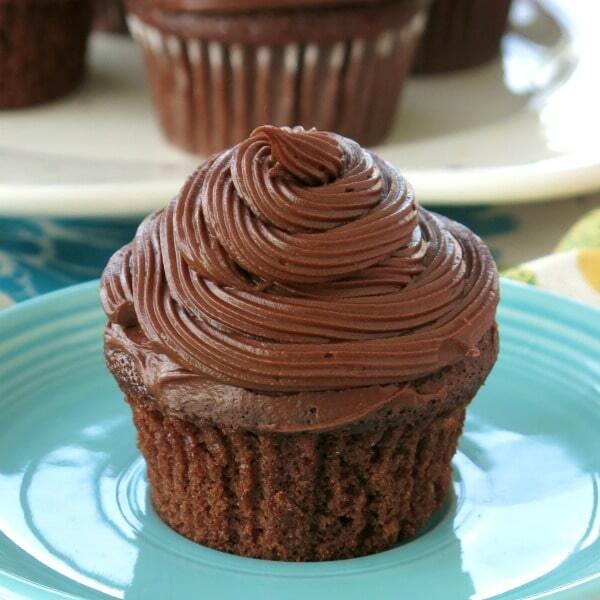 Rich and moist vegan chocolate cupcakes. You won't be able to tell they are egg-free. Perfect with a glass of milk. Top with powdered sugar or chocolate chips for a special treat. Or, decorate with frosting and sprinkles for the holidays. 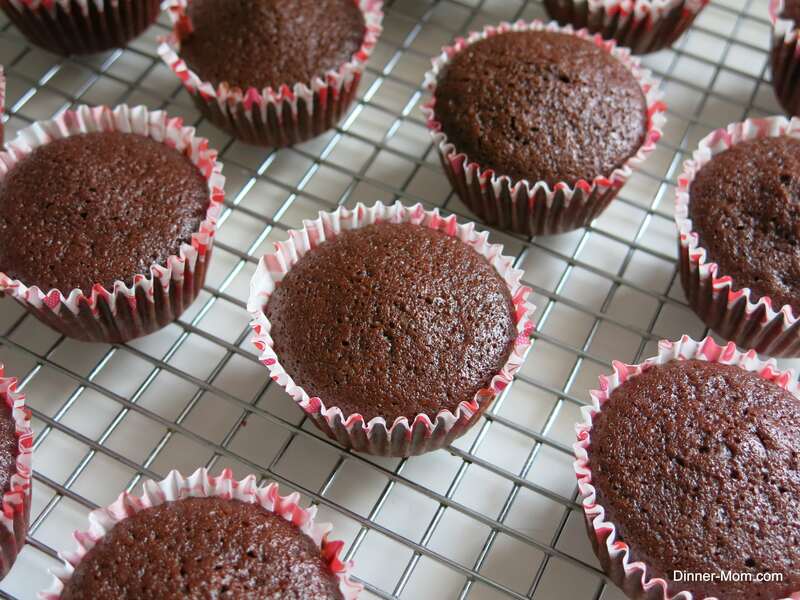 Spray muffin tins to prevent sticking, even if using paper inserts. Add wet ingredients to dry mixture and stir well with spoon. Fill muffin tin wells 2/3 full. Bake for 25 minutes or until top is firm and tooth pick comes out clean. 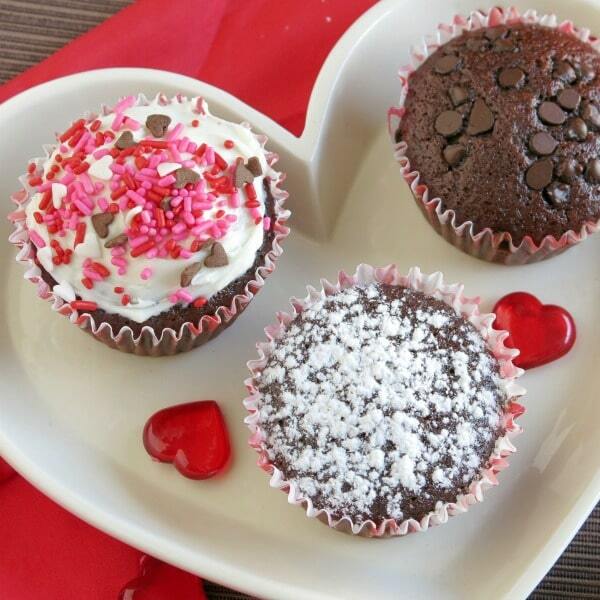 Allow cupcakes to cool for 30 minutes before decorating as desired. Enjoy! This recipe can also be made as a cake in a round or square, greased 9 x 9 baking dish. Cook for about 30 minutes or until top is firm and toothpick comes out clean. A girl whom my daughter attends day care with is allergic to dairy and eggs. It has been very hard to find a good chocolate cupcake recipe to use for our party. I’m excited to try yours! This has been our go-to recipe for many years. I hope you enjoy it! 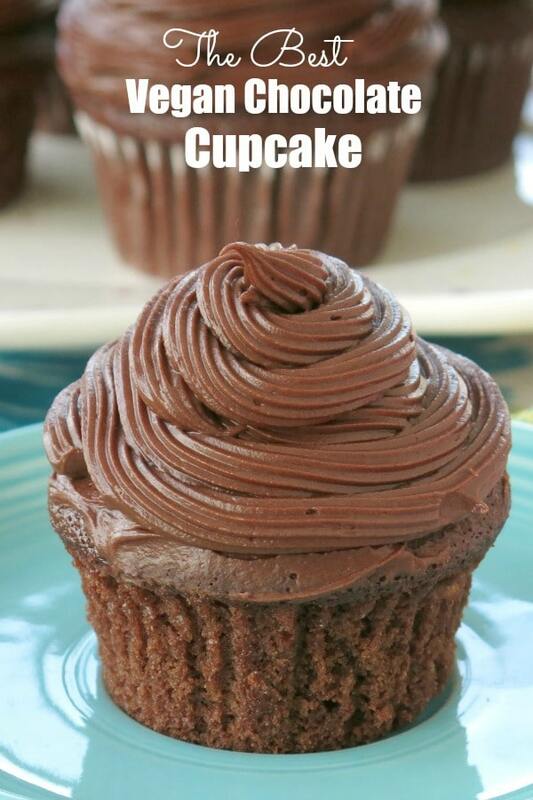 I think people don’t realize how perfect vegan chocolate cupcakes can be! I love the different variations on “wacky cake” and you decorated these so scrumptiously!! Oh yum! These are some amazing vegan cupcakes! They look pretty simple to put together too! The adorable little Valentine’s sprinkles are a nice addition. I am always amazing by how tasty vegan chocolate cake can be! I bet these were amazing! The cupcakes look so moist, they have my mouth watering! Adorable cupcakes! And you’re right, I’ve made vegan cupcakes before and nobody knew it was. Can’t go wrong with chocolate. Thanks for sharing all your tips! Yep! Chocoholics will love this! I followed the recipe & find the batter dry & crumbly, nor nearly moist enough to bake. I’m going to add some water. Help, Jeff then for this weekend. I missed the water 3x! I apologize. Trying to cook too much in too little time. Hi! It should yield about 14 cupcakes! Enjoy! Hi! I’m wondering if you used distilled white vinegar or apple cider for this recipe, and if it matters? We used distilled white vinegar. I’ve never tried it with apple cider vinegar. However, I think it would be fine. Hi there! I’ve never tried this variation so I’m really not sure how it would work! Love to know how it works out if you make the change!